England fans are gearing up for the Euro 2016! If you’d told an Englishman at the turn of the century that his country would win a Rugby World Cup, two major tennis titles, three Tour de Frances, and five Ashes series, they would have had you sectioned. Scotland and South Africa played their part, but the upshot is that England is reborn as a country of sporting belief. Millennials didn’t grow up thinking England were hopeless bottlers, and now they’re adults they appear to have a mental fortitude that previous generations lacked. Finally, England have players who want the ball and don’t panic every time they get it, keepers who don’t throw it into their own net, defenders who aren’t outpaced by a computer salesman from San Marino to score after 8.3 seconds, and midfielders who aren’t called Carlton Palmer. 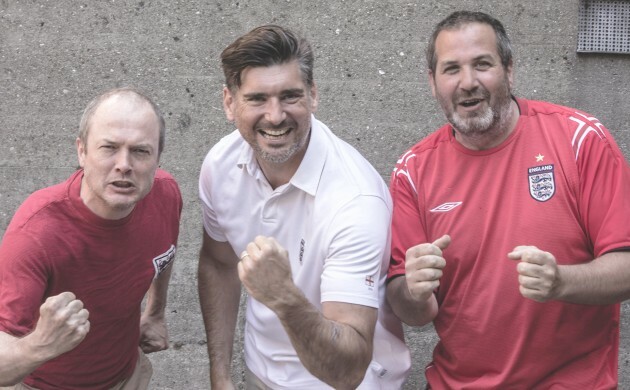 Neither (pictured left-right) Copenhagen Celtic Old Boys team-mates Ben Hamilton, Dan Savill nor Jim Goodley are Millennials, but they’ll take a win when they can get it. They grew up during an era well described in the 1996 song ‘Three Lions (Football’s Coming Home)’, since when the 30 years of hurt have become a full half-century. Dan, a senior director at Carlsberg Business Services who is going to the opening game, is hopeful coach Roy Hodgson can buck a trend and see the wood past the trees of the likes of Wayne Rooney. Jim, a carpenter at NCC who has lived in Denmark for 20 years, is also going to the opener against Russia. Despite a stellar season for his beloved West Ham United, it’s country before club this summer. “For the next four weeks they are a bunch of foreign wankers,” he said. Crystal Palace fan Ben, the managing editor of the Copenhagen Post, remembers how the last time his team made the FA Cup Final, England made it to the World Cup semis. “I expect us to bludgeon our way through the group, ride our luck in the knockout rounds, and then dominate against the eventual winners in the semis and go out in the cruellest of fashions,” he said.